How can I remove these files? The : is a reserved character on NTFS, the native API method I mentioned above is the recommended way to delete such files. I guess you can try the 8.3 name? 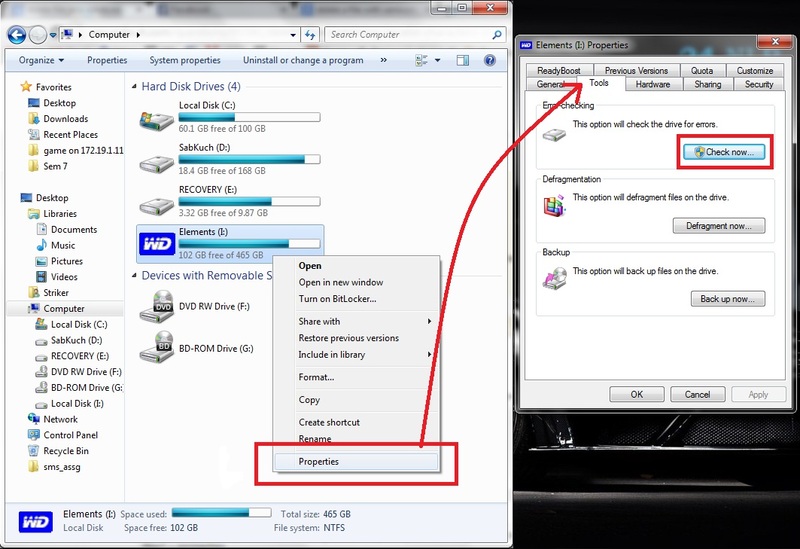 Close all the files, if any opened, that are saved in the drive which is containing such files. Now, Open the drive properties. Then, go to "Tools" tab and click "Check now" under 'Error checking' label. This will unmount your drive and will scan the complete drive for errors, eventually it will delete such files with illegal names. On finishing it will show a messages saying some files were fixed. I successfully deleted such files from my external hard disk. Try renaming the parent folder to a single character (a, 1, etc.) and then try to delete the parent folder. If it doesn't work then move to the first child folder and rename it to a single character and try the delete again. I often use this method for files with invalid characters (don't ask me how they get created because I don't know) or for files where the path exceeds the maximum (again, don't ask how this occurs). Have you tried quoting the filenames? Giving the exact command that you're running would be handy. Have you tried using a wildcard? For instance 'del 1d67c0d23e859ed4a259749e4a720d9e*. *' might work. Have you tried dir /X to find out the actual 8.3 name, and then tried deleting that name? Or, could that file have an alternate data stream? You might want to look at it wil the tool at http://www.nirsoft.net/utils/alternate_data_streams.html to see what that can tell you (I've never used that tool, it just came up when I searched). 7zip can delete files that Windows fails to; I've used it in the past when dealing with overlong filenames, but I've never tried it on files with colons in. They would normally be used to denote ADS. I had a folder with a commma in the name. I tried a few of the above suggestions and could not get them to work. I was able to delete the folders with cygwin. Installing that app isn't for everyone, but it will do the job. None of the above suggestions worked for me. I used WinRar. Open winrar and you will see a list of files, where you will the suspect file "filename " (which was created by you as "filename : some_text.txt". Rename the file in Winrar and provide it an extension (like .txt or .doc). Go back to Windows Explorer you will see "filename .txt" (Or doc). Delete it from there. Windows: How to delete files with a too long name? how i can get folder and file name in windows and store it in variable?